I have worn these blades since February. The owner/creator of Byonic supplied me these blades to test out and to give feedback on the blades. My Blade Story: In the winter seasons I play twice a week on awful ice. It is choppy and extremely soft, the rink is so old and poorly built the benches have exposed screws, metal plates, and concrete that there are many places you can easily knick up your blades and ruin your edge. When using my Bauer Vapor X100 skates with Bauer LS2 steel, I would be in a constant battle of getting sharp enough blades to comfortably take sharp cuts and hard stops. The steel was so soft it would feel as if I needed to get the blades sharpened every 4 ice times. I always had foot pain with my Bauer Vapor X100 skates, so I had a chance to purchase a pair of CCM Jetspeed FT1 I jumped on the opportunity. Using these skates gave me the opportunity to test out the CCM SB Hyper-Glide steel. Prior to my experiences I heard similar blade quality to Bauer’s LS2 steel, in that both blades don’t hold their edges well and are a softer than desired steel. I found those statements to hold true, but I was always skeptical in the advantages to the mirror like finish on the Hyper-Glide steel, I was curious if the steel actually lived up to its name. After about 4 months of usage I was confident the Hyper-Glide moniker wasn’t just a marketing ploy. While I was impressed by the gliding ability of the Hyper-Glide steel I was annoyed by constantly losing my edges and worrying if I was going to take a hard crash into the boards because of the softer steel. This concerns and issues led me to purchasing a set of Step Steel ST-ProZ. 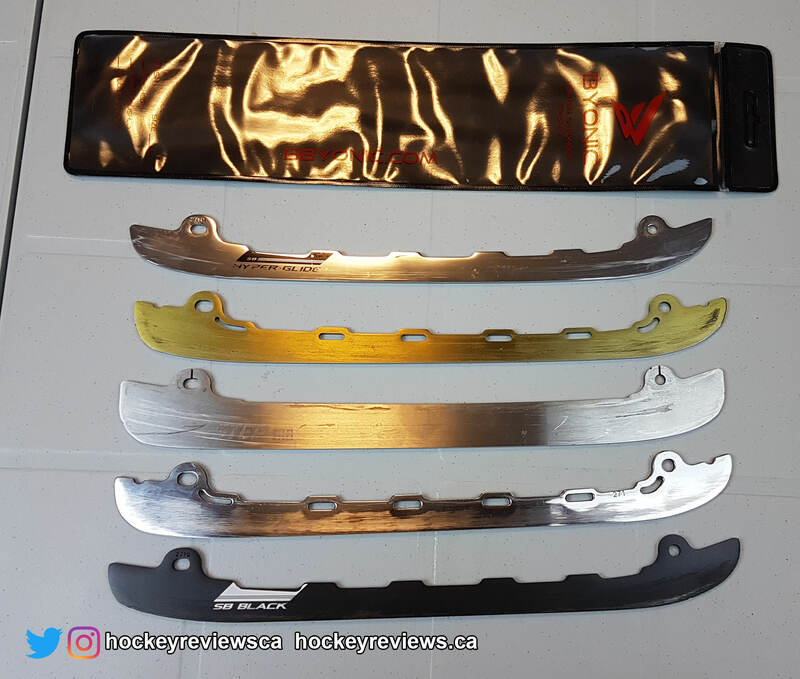 I ended up using these blades for a couple months (review coming soon) and the minute I switched to them I noticed how much they “stuck” to the ice when the rink becomes choppy and soft and wished I could get the Hyper-Glide gliding properties and the stronger steel properties of the Step Steel. My local stores didn’t have any of the V-Steel and I simply didn’t want to spend more money on Step Steel. Along comes Byonic Skate Blades, offering stronger steel like Step Steel and a polished design like the CCM Hyper-Glide. Nick at Byonic offered me a chance to test and use the steel, so I jumped on the opportunity. About Byonic: Byonic is all about weight savings in their blade design while still offering high quality steel compared to stock and aftermarket steel options. You can see in the pictures of the steel itself, the ridges along the top reduce the amount of material used and help gain a weight advantage over the competition. I have spoken to the man behind Byonic and he explained to me the idea behind weight savings in a blade and showed me his math. While my math days are behind me in university, everything seemed to line up and it made sense (see the picture below for a snippet of the math behind the idea). Byonic currently has a number of professional and college players using their steel, including: Mark Giordano, Brett Ritchie, and Brendan Perlini. Byonic also offers different colour coated steel options to add some flash or pizazz (sorry I really just wanted to use that word) to your feet, and while that definition of style might not be suited for you it is always a benefit to have options. 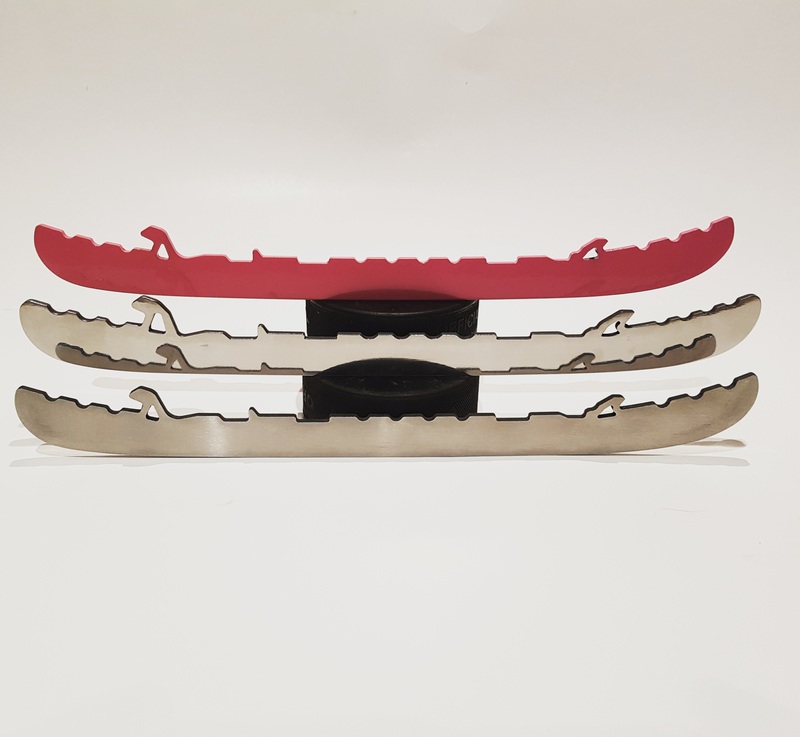 Byonic skate blades also come with a split profile (9/10 for Senior, 8/9 for Junior) which tries to offer a custom radius out of the box that will benefit more skaters than the stock 9 or 10 foot radius that comes with other steel. According to Byonic a number NHL, AHL, ECHL, NCAA & European pro players are currently using Byonic blades. Including: Mark Giordano, Brett Ritchie, Brendan Perlini, Ben Thomson, Nick Campoli, Bryan Cameron, Jamie Lewis, David Vallorani, Reggie Traccitto, and Kody Clark. Installation: I have switched steel out of many skates in the past few years (not just my own) and one of the common complaints of aftermarket steel is getting it into holders, specifically Bauer edge holders. 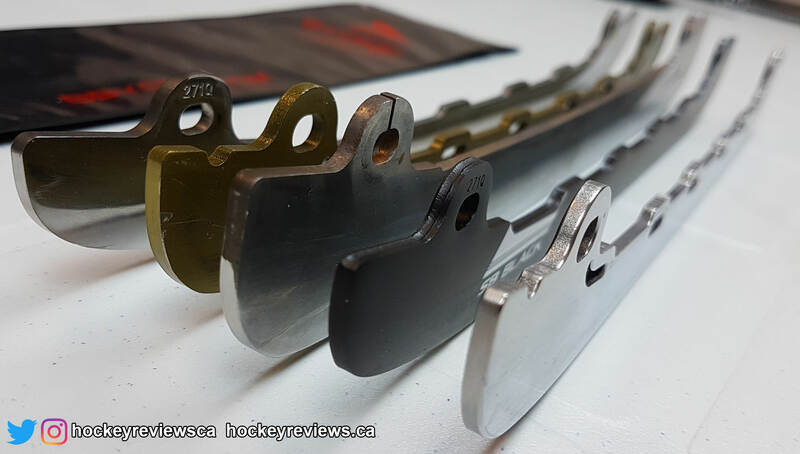 While these skates do not have Bauer Edge holders, I was shown samples and added and removed the steel from the Edge holders with ease and consistency. The same cannot be said for Step Steel with Edge holders, which some sets would be loose enough to wiggle when in place and others had to almost be smashed into place to get the Edge holder to lock. Stock Profile: Profiles are a very personal thing, every skater has strengths and weaknesses skating and all play the sport a specific way. So when I review the stock profile remember that it is my opinion on the profile itself. I really like what Nick at Byonic have decided to in regards to the stock profile of the Byonic blades. I firmly believe a proper profile on a skate will help a player’s skating abilities if they use trial and error to find a profile that really works for them. For me that is a Prosharp Qual 1 profile (which is a 6’/9’/12’/15’, see more on my profile on my Skate Profiles SnapShot). While I feel the 9/10 isn’t aggressive enough of a profile for me, I believe the little bit of forward lean would help the majority of skaters achieve more aggressive turns and more powerful crossovers. The 9/10 also ensures there is still a lot of toe on the blade so if the player wanted to move to a more aggressive profile they wouldn’t have to shave off too much blade to achieve their desired radius. Performance: While my Step Steel had a good amount of skates between when the steel needed to be sharpened, the stainless steel finish didn’t have the best gliding ability on the awful ice I skate on. My biggest problems occurred late in the game (or early in the game if late in the night since the ice is chewed up) when the blades would feel as if they were quickly running through sand causing my body to jerk forward with momentum while my feet and my skates slowed down. The feeling is similar to when bike riding quickly through sand or thick mud, you keep going but your body feels the momentum change and your balance falls forward. The Step Steel would feel as if you started to fall deeper into the ice, while the Super Polished feel as if it constantly glides over the soft ice. I tried experimenting with a more shallow hollow but I felt I lost my stopping, turning ability and overall confidence on my edges. 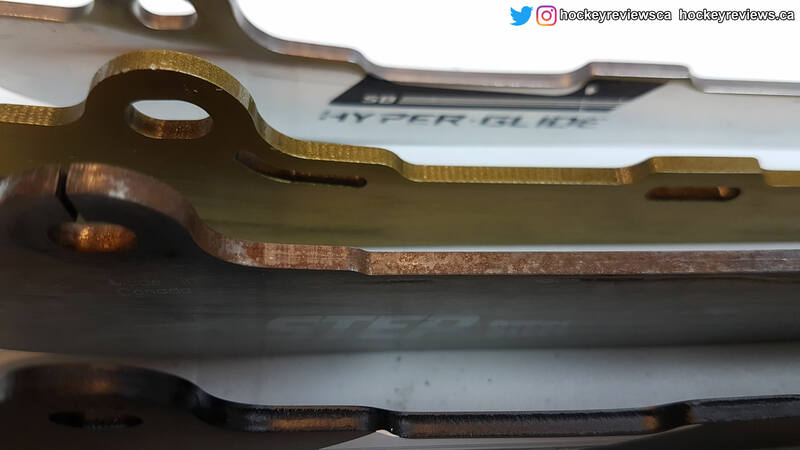 I found at my usual hollow the SB Hyper-Glide and Byonic Super Polished steel would stay with a constant glide throughout the game no matter the period. This means I feel less sluggish and I can keep my speed and tempo up at the end of the game as the blades never feel like they are working against my forward motion. Weight: With the cut out ridges at the top of the steel and the lower height, the weight of this steel is less than the larger Step counterparts. 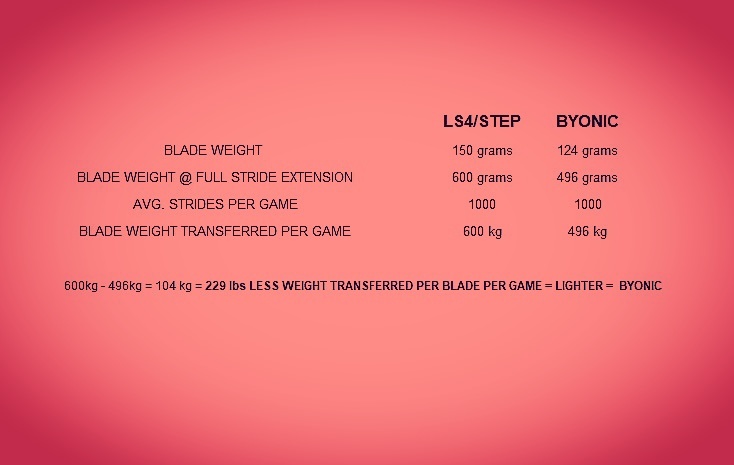 The Byonic Skate Blades come with a flatter heel and noticeably more steel than my stock CCM SB Hyper-glide and SB Black, yet the difference in weight is only a few grams (in favour of the CCM). Conclusion: Before the Byonic Super Polished steel, I couldn’t find a set of steel I was actually happy with. The CCM Hyper-glides were far too soft and the Step Steel just didn’t have the glide I want on soft and choppy ice. I understand Step Steel V-Steel and Black wasn’t available locally, so I went with the standard Step Steel. Byonic offers another option in the hockey blade market, adding a unique twist of colours and a profile I feel is an upgrade over the stock profile on most skates. 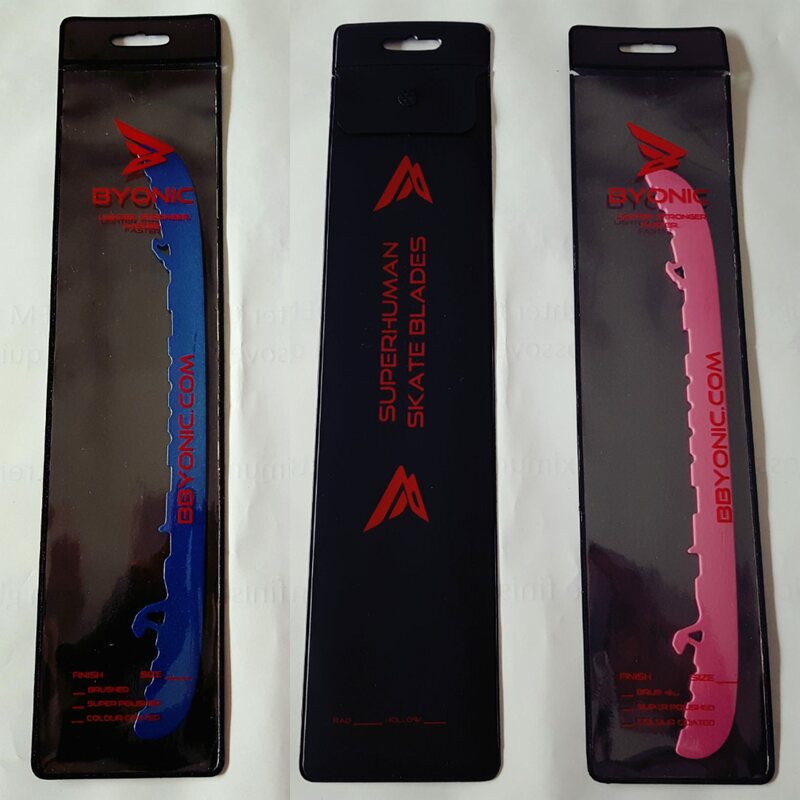 With the optional skate pouch, multiple colours or the Super Polished finish at a price that beats out the competitors, Byonic is a serious competitor in the blade market. I would highly suggest taking a look at the Byonic steel and if I needed a new set of steel Byonic would be my choice. Byonic has teased on social media that a black coating is coming soon, so one of my suggestions seems to be already in the works. Personally I wish Byonic also offered a slightly taller steel to really tick all of the checkboxes. The reason I didn’t score the weight category is that I don’t have enough steel to get a baseline of whether a product is light or not compared to the competition. While I have seen and had the math explained to me, I don’t believe the weight savings on steel would have enough of an effect on myself when playing.